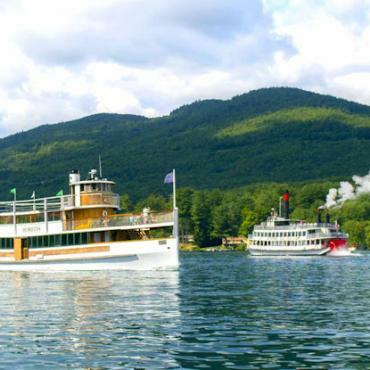 The majestic palisades of the Hudson River, the lush greenery of the Adirondacks and the sparkling waters of Lake George serve as a backdrop for this timeless journey through Upstate New York. Be as active or relaxed as you choose. 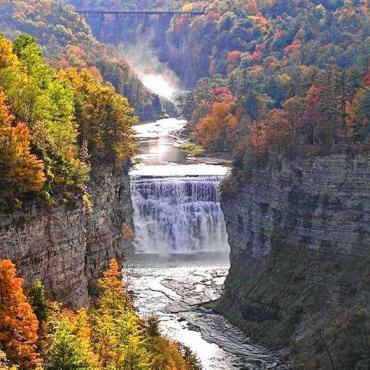 Upstate New York has it all, treasures and highlights with great places in between. 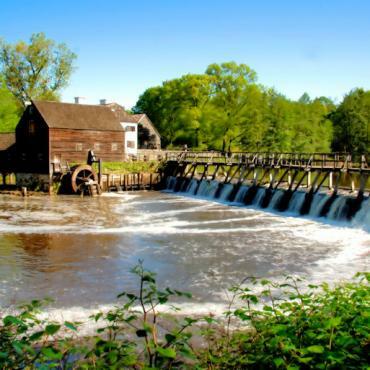 Ever since Henry Hudson came to call in 1609, the Hudson River Valley has been welcoming visitors to its spectacular landscapes, lush forests and soothing countenance. Back then, Henry thought he had discovered the Orient. 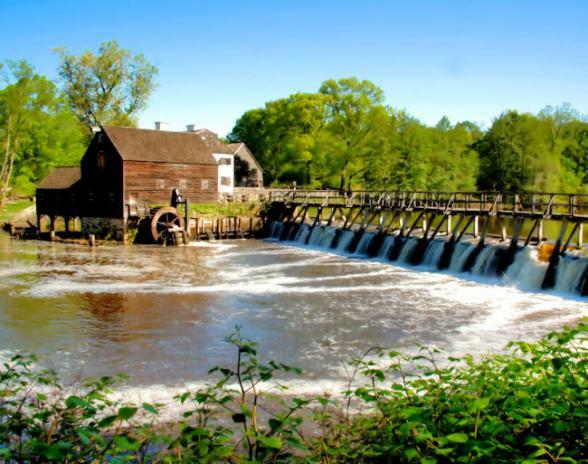 Today you can discover the rich heritage and wonderful natural beauty of the area on a very pleasant drive up the river. In the Lower Hudson Valley nearer Manhattan, rugged hills rise nearly 1,000 feet above the river. Magnificent mansions with names like Kykuit, Lyndhurst, Philipsburg Manor and Van Cortlandt Manor perch on top. By the time the river reaches the upper valley, the landscape smoothes out a bit, yet the views are still as spectacular. Farms and estates occupied by the same families for centuries span the river banks. Unknown to many, the Hudson River is also laden with several centuries of American history. General George Washington moved his headquarters to Newburgh and his friend Benedict Arnold served as commander of West Point. In the natural paradise of the Adirondacks, nature takes centre stage. 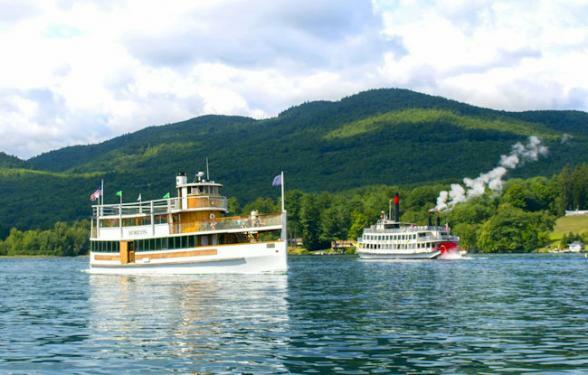 Noted for its sparkling lakes, majestic mountains and rushing streams, the Lake George region is the perfect place to get in tune with the outdoors, whether your preference is serene or extreme. In summer, flock to the crystal blue waters for sports, relaxation or just plain fun. In autumn, the trees light up the countryside with hues of amber, yellow and crimson. Enjoy the colours by boat trip around the lake or drive along meandering country roads.The area is also well known for its history and heritage. American novelist James Fenimore Cooper made Cooper’s Cave in Glen Falls famous in his novel, The Last of the Mohicans. The Adirondack Mountains are both wild and civilized by turns. The scent of balsam on a forest trail, surrounded by serene quiet, gives way to a collection of towns, each with its own uniqueness. If you love the outdoors, numerous lakes and ponds with endless miles of trails await. In between, you’ll discover historic villages, intimate dining, museums, galleries and antiques. 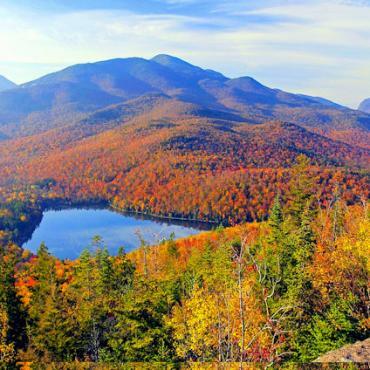 A scenic drive up Prospect Mountain Memorial Highway delivers breathtaking views of Vermont’s Green Mountains, New Hampshire’s White Mountains, New York’s Adirondack High Peaks and on a very clear day, the Laurentians of Canada. Be sure to visit The Wild Center, the natural history centre located in Tupper Lake. Outdoor exhibits take visitors into the ecosystems that surround the Center with canoe trips on the river and daily guided trail walks. Indoor exhibits focus on the 50 species of animals that live around the Center. The Adirondack Museum at Blue Mountain Lake is also a must see. 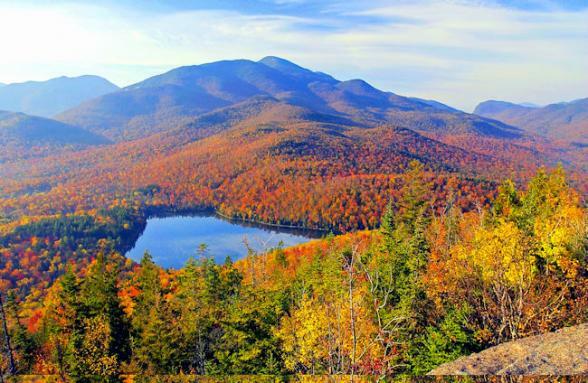 Set amidst the High Peaks of New York’s Adirondacks and surrounded by abundant lakes, rivers and forests, Lake Placid is best known as the two-time host of the Winter Olympics in 1932 and 1980. 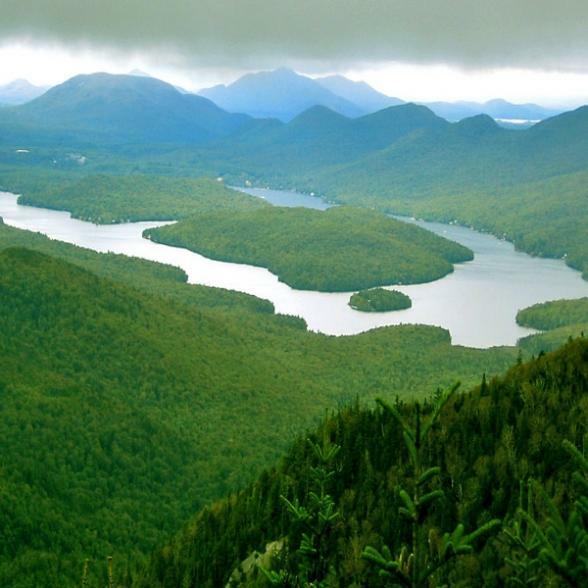 Over 200 miles of hiking trails form a network for walking through Adirondack Park. 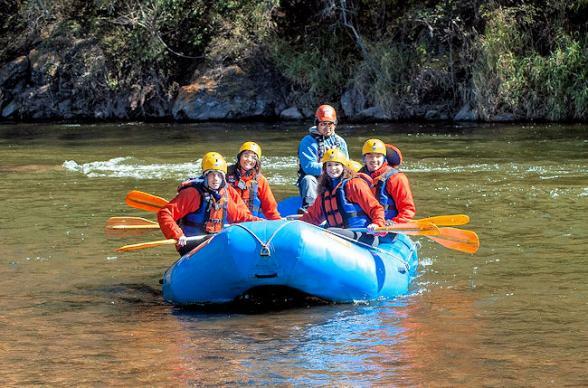 If you want to be seriously active, you can raft the rivers, fly over the Adirondacks, ride the Adirondack Scenic Railroad, fly fish, or bungee jump. 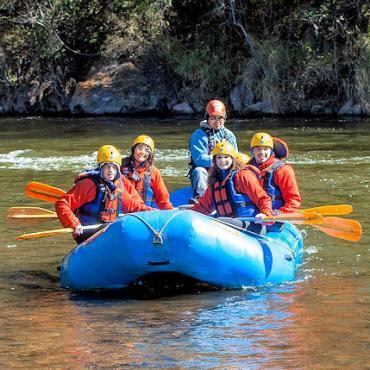 Horseback riding, mountain climbing, backpacking and bicycling are also possibilities. If you want to take a more relaxed view, ride the ski gondola to the top of one of the mountains or visit the many galleries, boutiques and museums. 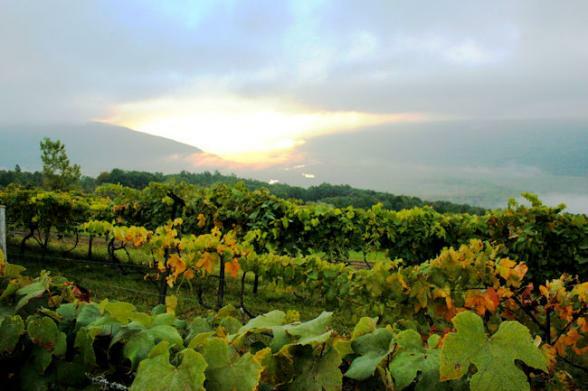 The Finger Lakes region is made up of 11 lakes is New York's largest wine producing region. Some highlights include MacKenzie-Childs, Ltd, located on a picturesque farm on Cayuga Lake, produces beautiful hand decorated ceramics and home furnishings. 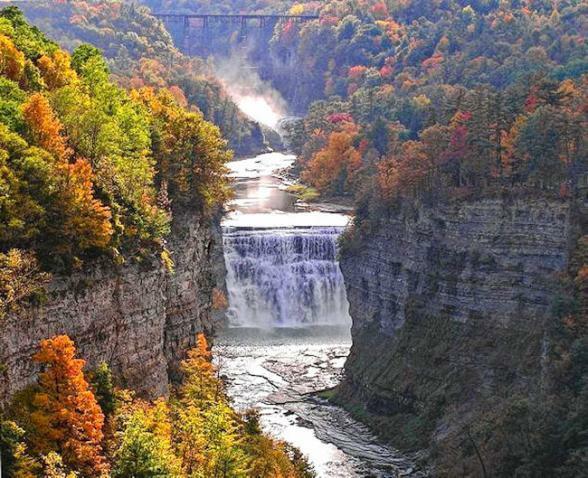 Letchworth State Park, known as the Grand Canyon of the East, covers 14,000 acres along the majestic Genesee River. Scenery and waterfalls unfold throughout the gorge. World-renowned chefs and famous winemakers come together to share their secrets at the New York Wine and Culinary Center, located in Canandaigua. Watkins Glen State Park has a descending stream that cascades 400 feet down past 200 foot high cliffs. Chemung County has become known as the Soaring Capital of America. You can take a sail plane into the skies while enjoying some of New York’s best views. 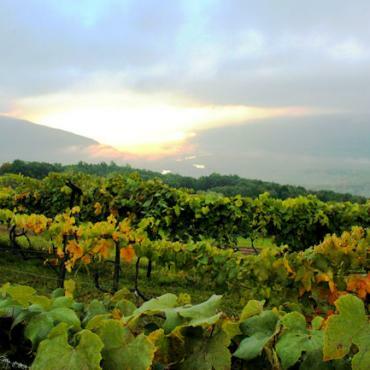 Everyone should experience a New York wine trail at least once. At Bon Voyage we suggest the Cayuga Wine Trail, a collection of 27 wineries which surround the sapphire waters of Cayuga Lake. The climate is perfect for growing hardy native grapes and hybrids including a more delicate variety that produces truly fine wine. Experience nothing else like it as millions of gallons of water rocket over Niagara Falls every minute – about 750,000 gallons each second. Niagara is the collective name for the three waterfalls that straddle the international border between Canada and the United States. 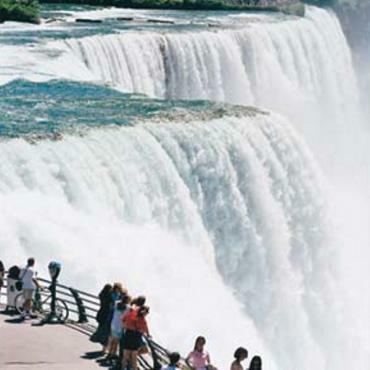 They include Horseshoe Falls, American Falls and Bridal Veil Falls. Horseshoe Falls lie mostly on the Canadian side and American Falls entirely on the American side. The smaller Bridal Veil Falls are also located on the American side, separated from the other waterfalls by Luna Island. See and feel the spray up close on a Maid of the Mist boat trip, a Niagara must. Also not to be missed, are the illuminations - every evening at dusk the falls come alive with the colours of the rainbow. Book dinner at Terrapin Grille located in the Marriott Fallsview hotel for an incredible vantage point. 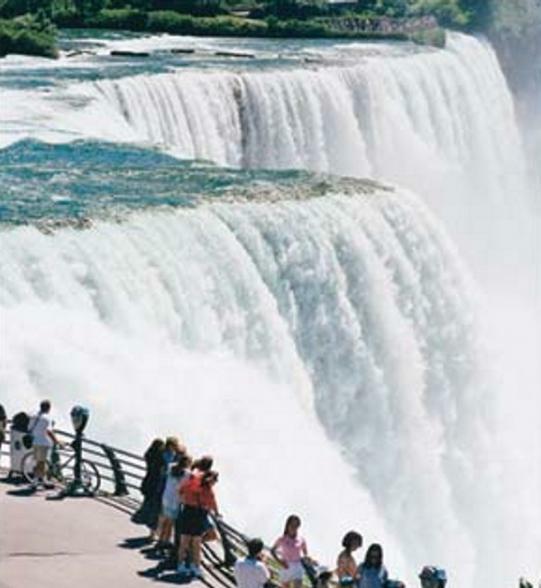 Get a leisurely start today and make sure to take one last look at Niagara Falls before departing for Corning. 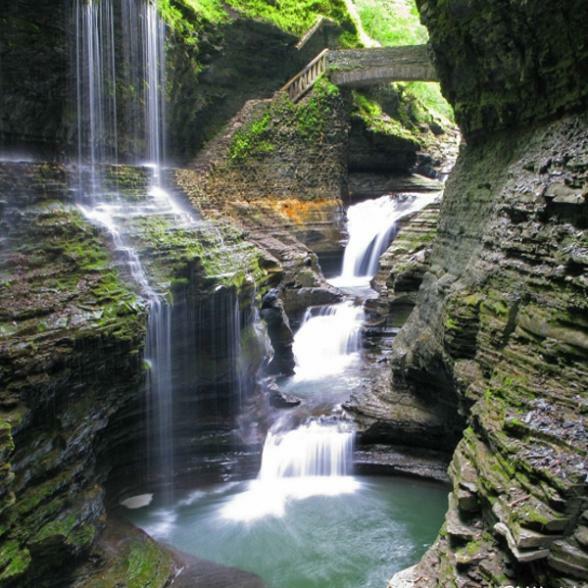 If you did not have the opportunity to visit Watkins Glen State Park, you can do so on the way. Corning is the headquarters of Fortune 500 Company Corning Incorporated, a manufacturer of glass and ceramic products. It is also home to the Corning Museum of Glass, which houses one of the world's most comprehensive collections of glass objects from antiquity to the present. The city's other major cultural attraction is the Rockwell Museum which contains an important collection of Western American painting and sculpture. It's an early start back to New York City for your flight home. 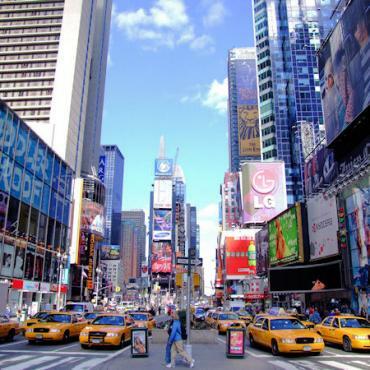 However, you don't have to leave just yet, why not extend your holiday and spend a few days exploring the Big Apple and some extra shopping. 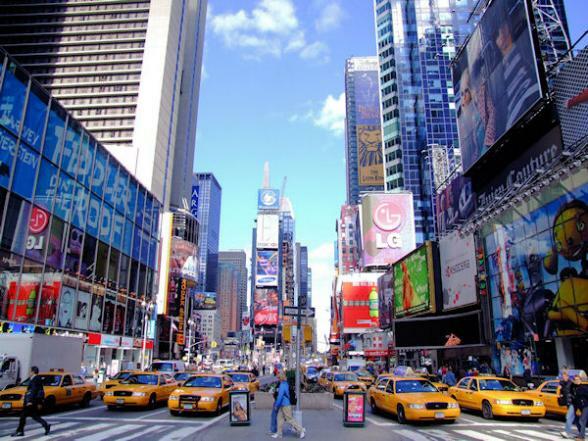 Call Bon Voyage, the travel experts, to discuss your ideal New York state adventure.